My last school visit of the summer term involved driving along the M4, onto the infamous M25, and into deepest Essex to visit one of our favourite schools – Billericay School. Well worth the drive! Our good friends, Jacqui, Kim and the other library staff were waiting to give me a great welcome (as usual!). I say ‘me’, because my wife, Kath, had stayed back home to rest her aches and pains from the extensive driving we had done recently. Having said that, she was already booked to help look after the grand children – not so resting! Back in Billericay, I took a deep breath and launched into a presentation of my latest football-themed, super-scary book: Kruschmeister. The 300+ Year 7 students packed into the auditorium gave me their full attention for around an hour, before a short break and part 2 of the presentation – Ten O’ Clock Caller. 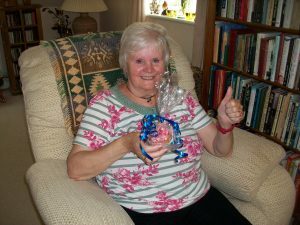 KATH WITH HER BILLERICAY CUPCAKE! pleased to say that the Billericay students seemed more than impressed, as I’m sure everyone will be when they reach the public eye. Our cover artist, Paul Bryn Davies, is surely the most talented cover artist in existence! During the subsequent book-signing the next day, I was impressed with the fab display of my work in the library I just had to take a pic with my phone…I hope you like it. And since returning home, I took a pic of Kath with the special cake sent by Jacqui and tied with a ribbon by Kim…hope you like that pic too! Thanks to everyone at Billericay School for making me so welcome and to Jacqui and her library team for looking after me so well in Kath’s absence. We look forward to being back after the release of the new Mokee Joe book. In the meantime, have a great summer…everyone! After working in Berkshire for a while, it was good to head north up the M1 back to our northern roots around Rotherham, Sheffield and Doncaster. First port of call was to a new school to us – Pheasant Bank Academy, at Rossington near Doncaster. The lovely Headteacher (Mrs Robinson) knows us well from her previous school and was keen for me to fire up her new pupils to use their imaginations in a good read (or two!). Well…she needed no worries! 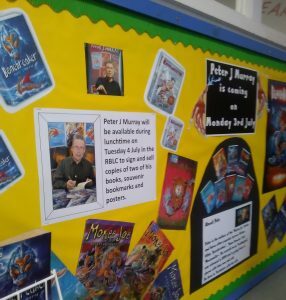 The large KS2 audience joined in our presentation with great gusto and the next day we enjoyed a huge book-signing…each and every pupil being polite and a joy to chat with after their long wait in the never-ending queue. 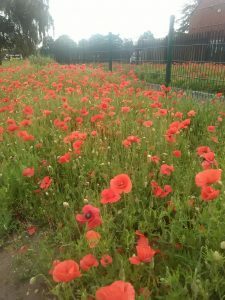 One interesting point about the school is vast amount of poppies growing along the edge of the staff car park. No one planted them and it’s a mystery why they are there. I immediately felt a spooky story coming on…ghostly WW2 soldiers appearing at dusk among the fading blood-red flowers… Thank you Pheasant Bank Academy for making us so welcome. We can’t wait to be back. Following the great visit described above, it was time to move on to several schools in my home-town of Rotherham; to visit five schools as part of the ACET academy trust, introduced to us through our good friend, Martin Mullane. Thurcroft, Aughton, Listerdale and Lowedges Junior Academies, along with Swinton High School and a visit to our old friends at Oakwood High School, provided a whirlwind of visits that left us breathless (literally!) The enthusiasm and energy of countless friendly and welcoming staff and pupils was a credit to all involved. After all the bad press associated with Rotherham over the past year or two, it’s so pleasing to report on all the immense positivity we experienced during our two weeks there. One thing that really impressed us was the way in which these school communities pulled together, and Kath and I really felt that the immaculate striking uniforms that the ACET trust have adopted helped greatly in this way. All of the pupils without exception were smartly turned out and seemed proud of their attire! Brilliant! One of the Oakwood High School Year 8’s was so impressed with our Kruschmeister book that he took it on himself to construct a trailer film for the book! It’s nothing short of amazing and I’ve been showing it to everyone, including the pupils during my current school visit at Billericay (see next blog report). Feed back like this makes us very proud. As we always say, there is such talent out there among our student audiences, (bring it on!). From Rotherham, it was down the A1 heading into the Fens to arrive eventually in Suffolk to visit our ‘very’ old friends at Northfield St Nicholas. Our librarian friend, Julie Gulliver, was waiting to give us a nice hug and begin looking after us in the usual high-standard way of East Anglian hospitality. I’ve been Patron of Reading for quite a while at this school and we always look forward to our visits. The pupils are huge (or ‘hooge’ as they say in this part of the world) fans of ours and are already familiar with all of my books. We passed a very quick day of workshops with each year group and a ‘fun’ time was had by all. As I always say to our fans, ‘If it’s not fun then it’s not working as is should be.’ And that applies to reading, writing and all forms of artwork and literacy. spent our honeymoon in this resort more years ago than we care to remember. 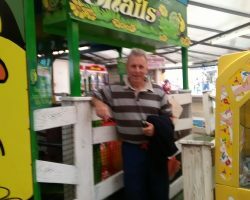 I even got to search out the ‘snail ride’ by the side of the pier, which I adored as a child. Oh well…back to Berkshire for a brief respite before heading down into deepest Essex for our very last school of the summer term – none other than Billericay School…more VERY old friends of ours and a great venue to finish on a high note before a long rest during the long summer hols! By for now, everyone…and if anyone has any pics they can send from our visits to include in this post, please e-mail them to me asap.